We wanted to make clear the best way to get the help you need from our Customer Support team. If you are having an in-game issue, for example: your character is stuck, game play questions, etc. 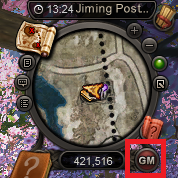 please contact Support in-game using the GM button on the minimap. If you are having account related issues, for example: problems purchasing the Deluxe Edition, unable to log into your account, trouble activating a key, etc. please utilize our Customer Support Webform. Following these guidelines will ensure that your help request is addressed as quickly as possible. Update: See this thread for more information on our Customer Support hours, availability, and contact information.